Make your night pack a punch with sourz shots for just £1 each – the perfect buzz to prepare you for a night on the dance-floor accompanied by the sound of electro-swing DJ, Jamie Berry. Our very own Surge Radio will be taking over the decks with a DJ set to keep you partying until the early hours. Capture the memories with photo opportunities complete with a Moulin Rouge-themed backdrop of the famous windmill, plus many more decorations to make the night glitter, as well as chance to hit the photo booth. 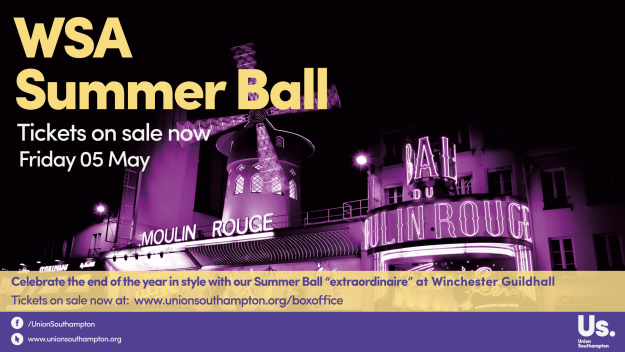 Tickets are available for £25 each from our BoxOffice at www.unionsouthampton.org/boxoffice. Tickets can be collected at the WSA Cafe using your Student ID and email confirmation – simply specify your preferred collection location (WSA Cafe or Union Box Office at Highfield) when you buy your tickets online. Make sure you bring proof of age ID and your Student ID, along with your ticket to gain entry on the night.